When the Eight of Pentacle appears in a Reading it suggests that you are working very hard, not just at present, but over a long period of time. This is something that you find quite easy to do as you are completely dedicated to the task at hand and like nothing better than to get stuck into your work. Like the Eight of Wands, life has taken off for the Pentacles too. You are bound to be crazy busy at present, mega productive and super industrious . It seems like you can make a success out of anything you decide to turn your hand to. Any obstacles that may have stood in the way in past are now history and you are free to pursue your course of action and any projects you may be working on. You are now at liberty to indulge your own interests and special projects too. There is a wonderful sense of coming into your own and feeling extremely confident about what you do. You work with a strong sense of purpose and life is feeling wholesome and worthwhile. Everything is falling into place and your two feet are firmly planted on the ground. This is a time for making excellent progress. The Eight of Pentacles heralds success as a result of sustained and concentrated efforts. Your commitment and unrelenting effort has paid off and you are now in a very strong position. While others around you have been running around like headless chickens, trying this and that, you have kept your head down and hammered away on making progress in very specific areas. Where you are now is not a case of just being lucky for you have earned every cent of your success from serious application and self-discipline. This Card very often deals with finances and career but the success that accompanies this Card can be applied to any area of your life. Not only are you a success at what you do, but others see you in that light as well. You may see yourself as someone who is just getting on with their work but from the observers point of view, you are a role model and inspirational. One of your many outstanding qualities is the impeccably high standards you set for yourself and everything you get involved in. You believe, that if a ‘job is worth doing, then it is worth doing well’. You are scrupulous in your attention to detail and the quality of your work is excellent. The Eight of Pentacles suggests that you are highly qualified in your field of expertise and probably have attained other ‘above and beyond the call of duty’ diplomas and credentials. It is no doubt that you are ‘top of your field’ and ‘top of the class’. You would be considered an expert by your peers and someone who has vast experience behind them. You are highly sought after. Another of your qualities is patience, and when this Card appears in a Reading, it will be asking you to take your time and not attempt to take any short-cuts with what you are doing. It is quality and not quantity that matters at the moment so you must pay attention to the fine detail and not just be in a hurry to get things finished and done. Only your best work will do and possibly even more is expected of you now, so do not disappoint. Keep hammering away until you get it just right. You have really come a long way and should be proud of your abilities and all that you have achieved. The Eight of Pentacles appearing can act as a reminder to do something that you really enjoy doing. That something may be work-related, relationship, hobby, sport,travel or just about anything. When you love what you do, it will always shine through and work that is completed with love will stand out from the rest. The Pentacles are associated with the material world and the physical body so it is easy for them to get carried away with only caring for the Outcome. They can become workaholics, financially successful but dull and boring or health freaks who allow themselves no treats or rest. This Card however, brings maturity to the Pentacles Journey and carries a very strong message. The Outcome or Reward of course is important, and we all must set goals to work towards, but the journey to the desired outcome or goal is as important if not more. To be ultimately successful like the Figure in the Imagery of this Card we must be on a journey that enables us to wake-up in the morning and hop out of bed, eager to get on with the day’s work, instead of the horrid bone weary dread of dragging ourself into another day of drudgery. We must be able to look back on our journey once completed, with fond memories and pride. The Eight of Pentacles promotes hard work and effort in order to yield results but it certainly would not condone viewing your journey as a chore, necessary evil or tedious. If you are not happy doing what you are doing then go out and find something that will. The Eight of Pentacles can suggest that you have very strong abilities or skills that you may not be utiliising to your best advantage. You may have a hobby; doing or making things in your spare time, which brings you great joy. This hobby has been finely honed over years of application and trial and error. You probably self-taught, through research and reading up on your subject. Your work is more than likely exquisite but is possibly kept to yourself. The Eight of Pentacles can be indicating that you are sitting on a goldmine. It may be time to show others your abilities and skills by exposing it to a wider audience. Your own impeccable high standards may not deem your work fit for sale as you can be your own worst critic but I guarantee you that others will be excited by what you have on offer and will be prepared to pay for such high quality work. Time to tidy up on your presentation skills and showcase your work at an exhibition, trade show, craft fair or market. Take your work to the people and let them make up their own mind. If you feel unsure about certain areas, then do a few evening or online courses to add a professional touch. You could also seek the advice of a Mentor at the Local Government Enterprise Offices. The Eight of Pentacles is often a Card for study and learning but unlike the Three of Pentacles where the Figure was only starting out as an Apprentice, The Eight suggests that you may be working to add to your existing qualifications or getting re-trained. The Pentacles hanging on the Wall in the Imagery may be your proud display of Degrees, Diplomas, Certificates and Awards . This is not someone approaching their subject for the first time but rather someone who is interested in specialising in a certain field of expertise. This is someone who wants to be the best at what they do and become a Master of their trade. You may be going for your Masters, PhD, Consultant or Professor. Education is important and you will be happy to add to it wherever you can; taking classes, courses or online study, anything really that will improve your existing skills and expertise. The Eight of Pentacles can suggest that you are going back to college as a mature student or gaining extra qualifications through work. You may be planning to do or start-up something when you retire and are getting trained in that particular area. There is certainly a plan of action and you know exactly what it is that you are doing and want. An alternative message to the one above can suggest that it is time to push yourself some more. Even though you have worked consistently hard and are highly qualified, you have not fully realised your true potential. The Eight of Pentacles can appear to ask you to raise the bar even further to improve your performance, for you are well capable of it. You can do even better than what you have done to date. This Card can suggest that you might have reached a stage where you have plateaued and are pondering over whether you need to do more or be content with what you have achieved. It is for certain that you are aware of areas, qualifications or skills that would be well worth adding to your repertoire, portfolio or CV. Whatever dream or ambition you may be considering chasing, it is well within your capabilities and reach. It will involve having to work hard of course, and you will be expected to fit your studies into an already very busy life, but any sacrifices made will be well rewarded. The Outcome will bring substantial gain for you. The Eight of Pentacles can also symbolically represent being awarded a Scholarship or being given the once-in-a-lifetime chance to study under one of the Great Masters. Go for it. The Eight of Pentacles is a Card for commitment to a person or situation. Great effort is put in to maintaining a high standard of work whatever it may be related to. It is a Card for success and building on further success. Commitment to your community and environment is also very important and this Card asks you to help out wherever you can, especially using the skills and knowledge you have at your disposal. Think of what it is that you have or can do which might benefit others around you. Experience like yours is invaluable and you might be able to give someone a start by taking them under your wing. Don’t look at it as tedious or boring but more so as the opportunity to pass on your knowledge or legacy to those who come behind you. Take the time out to share you success with those around you so that they too may have the chance to be successful in their own right. Healthy and fit too, The Eight of Pentacles suggests you are paying much attention to your body and looking after its needs. Exercising, eating healthy and getting plenty of outdoors activity does take a lot of self-discipline but it’s no problem as you have it in bucket loads. The Eight of Pentacles confirms that you are or will (depending on position in spread) be feeling very well and strong in mind and body. In fact you haven’t felt so well in a long time, but that is also because you are emotionally happy too. You are doing exactly what you want to be doing and you should be proud of yourself. When it comes to relationships The Eight of Pentacles suggests that you are putting great effort and commitment into your relationship. This is a very strong and secure relationship, based on trust, faithfulness and loyalty. You understand what it is that you need to do to keep your relationship stable. Your relationship means a lot to you and you will do whatever it is to make it work. You may also be taking steps to improve on your relationship instead of letting it trundle along. You are conscientious, caring and not prone to taking your partner for granted. This relationship is relaxed and steady with no emotional or aggressive outbursts. You do not consider this hard work as you consider your partner is worth all the effort. This is indeed a work of love. However, financial security is also very important in your relationship, so you may be working hard to build a secure future for you and your partner or family. Make sure you remember to go home regularly and make some time for fun and social activities. The type of person you are, leaves you exposed and vulnerable to becoming a workaholic. If you let this happen, then it may very well destroy your lovely relationship. You must work hard at striking the right balance. You can have both you know! With regards to career or business, the Eight of Pentacles is a very positive card and not only shows that you are working very hard and very diligently, but that you also love what you do. You are committed to your goals and ambitions and accept the hard work that is required to realise them. Those around you in the workplace turn to you for advice or to follow your lead. More people learn from you than you realise. It is for certain that you are a hard-worker and have no problem working on your own. You use your initiative and are diligent in your approach to every task. No job is too small or too big and all are equally important. You take set-backs in your stride and when a mistake is made, you learn from it instead of giving up and walking away. You can be trusted to complete any task given to you and are not easily distracted. You have the makings of being the perfect Home-Worker because you are super-disciplined and can work on your own initiative. You are likely to work long hours and prefer to be allowed get on with your work without interruptions and obligatory break-times. In Business, The Eight of Pentacles can indicate that you are working flat-out at present and are constantly on the go. Orders and contracts are flying in with staff working overtime to meet the increasing demands and ensuring consignments are despatched on time. You have no doubt built a reliable reputation for professionalism, quality and service within your industry and will be eager to build further on these. Keep up the good work. Should you be planning on starting a Business, then The Eight of Pentacles lets you know that you have the commitment, dedication and tenacity to make it a success. The success is in the detail of the business and that is where you excel. Getting down to the nitty-gritty, and painstakingly going through all the ins and outs, is something that most of us try to avoid, but not you. You will cover every area, giving it your full attention, checking and then checking again to make sure nothing has been overlooked. You are methodical in your approach and very resourceful. Knowing your subject or field of expertise inside out will be the key to your success. You might think of getting some extra qualifications to put you top of your game and in a league of your own. If you are looking for an idea for your business, then look to the nearby community to establish what it is they need, for they will most likely be your best and most loyal customers. If you are hiring staff for your business or interviewing, then the Eight of Pentacles advises you to select only the best and most highly qualified, even if it does entail increasing the package that is on offer. These highly skilled staff will make an excellent investment for your company and will raise the standards of their fellow employees. You may also consider making an investment in further training or education for your staff. The payback will be noticed in increased profits for you and your business. The Pentacles hanging on the tree can symbolise all your qualifications or displaying your goods for sale in a shop window. Maybe you are working on pieces of art or sculpture to exhibit in the local town. This card suggests that you have many qualifications, talents and abilities. If working on a project, entering a competition or looking for sponsorship your hard work and effort will pay off. You may be working hard on building up your business even if it does isolate you from friends and family. The Eight of Pentacles can also suggest that you have several projects going on all at the same time. People may be advising that you ‘have too many fingers in too many pies’ but you are well able to manage and pace yourself when this Eight is Upright. The Eight of Pentacles is one of several Cards in the Tarot that put an emphasis on Community. 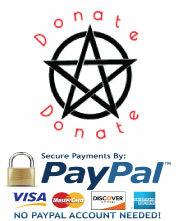 It is a Card that appeals to your conscience and asks you to make a contribution or to give something back. If you are in a position to help others as a result of your success, then you should make an effort. Time spent in volunteering, mentoring or sponsoring those less fortunate, or individuals who show natural ability or skills, will be immensely worthwhile and rewarding. You could take in a few interns, sponsor a related competition, offer a scholarship or provide funds for projects and building. Well, what a change when the Eight of Pentacles Reverses. Instead of the commitment and dedication of the Upright we now see a lack of commitment and disinterest when it Reverses. When we look at the imagery of the Reversed Eight, the Figure now appears to be careless with his work. 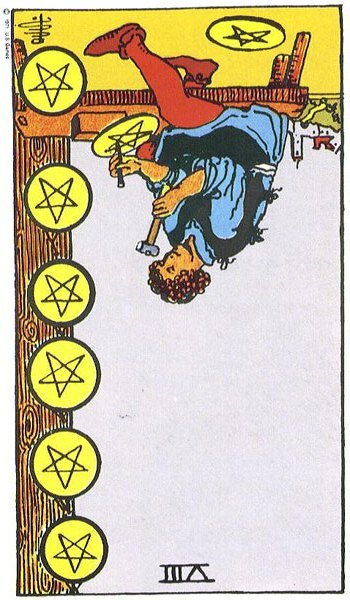 The Five Pentacles hanging on the wall, along with a sixth balanced precariously against the leg of his bench all now display the Pentacle in its Reversed Aspect. There is even a Pentacle cast carelessly on the ground where anyone could walk on it or trip. This is not good, not good at all. The Reversed Aspect suggests a disconnection between the physical and spiritual. The Physical/Material side of Pentacle/Man dominates and governs, while the Spiritual/Emotional side is suppressed. This will lead to all kinds of problems and changes in behaviour. It has now come down to all about the Outcome and Results. Call it what you like, but we now see signs of being overly materialistic and money grabbing. When this Card Reverses, we now see the town and community above the man. To the Pentacle Man, it and the people who live there, are out of sight and out of mind. All he can see now are his Pentacles and what they can do for him. He builds on his success and accumulates, but it is all for him. This can suggest that you are so caught up with all that you are doing and working towards, you give no thoughts to those around you. You may be in a very privileged or advantageous position where you could help others or make a contribution yet fail to make any effort. You may not believe that it is your responsibility or that all should work as hard as you do to get ahead. Remember, that not all have the same drive as you and their personal circumstances may be very different to yours. When The Eight of Pentacles appears it can be a harsh reminder that hard work, diligence and putting in the necessary time is not something that you are familiar with. You cannot proudly claim these admirable qualities amongst your standards and principles because they just don’t mean a lot to you. Indeed, the less you have to do the better. You may desire all the rewards and benefits that hard work and effort bring but that is where your interest ends. You lack the will power and self-discipline that work requires. You may believe that hard work is for other people and that you know a better way of finding success. 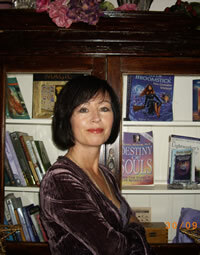 Whatever it comes down to, it is bound to involve taking short-cuts and trying to turn a quick book. There is certainly no plan of action other than to make gain as quickly as possible and by doing as little as you can. Qualifications and study are for fools as far as you are concerned, because you know that you can get by without them. Sure, you can even buy qualifications on the internet. Studying and books are not your thing and you prefer to do a bit of this and a bit of that rather than apply yourself to any one particular area. Heaven forbid that you might actually get knowledgeable if you did. To the casual observer, you may look like the ‘real thing’, a successful person or business man/woman who must be busy and ‘rolling in it’ because you will undoubtedly display all the trappings of success, such as fancy car, offices and stylish suits. You will promise the world and take everything that comes your way. You will also take money up front before lifting a finger to earn it. Then comes the even harder bit, getting started on whatever project or job you have agreed to do. You just find it very difficult to muster up the enthusiasm and will drag your heals for some time before making a half-got effort at starting. With lack of interest, discipline and a sense of pride in your work, you may find it impossible to finish any task you start, especially if it comes down to the more detailed or tedious side of it. You will avoid it at all costs and find endless excuses as to why you can’t do it right now. With no heart or pride in your work, it is bound not to be up to much. The work suggested can be absolutely anything you are involved in and not just business work or a job but very often the Eight of Pentacles represents such areas. Your attitude to anything you do is ‘ah sure it will do’ or ‘it’s fine’ or ‘who cares’ , ‘sure it’s only….’ and ‘sure, nobody will notice that’. You actually could care less about it and believe that you have better things to be doing with your life than wasting your times on such boring and tedious things. You have an in-built natural lack of respect, not just for your work, but also towards those you deal with. The Eight of Pentacles Reversed can suggest someone who is a bit of a chancer and prepared to take advantage wherever they get the opportunity. Having a good reputation means little to them as they are bound not to have many repeat visitors, customers or clients. There will always be plenty more gullible and unsuspecting people out there. As a result they have a tendency to botch up jobs, leave work unfinished, try to rush it or take short-cuts. When the Eight of Pentacles Reverses, the proud detailed work displayed in the Upright Card only appears so from a distance when it Reverses. On close inspection it can be quite shoddy and unprofessional. It may look thrown together, poorly designed and roughly finished. The Eight of Pentacles can suggest the rogue builders who are not properly qualified and lie about their abilities and skills. They promise you the world and will badmouth other credible builders just to get the job from you. Money is usually required in advance ‘just to buy the supplies of course’ and usually they will tell you they can get the job done much faster than the rest. Then they don’t turn up on the first day, or the day after that, or the day after that. Phones go unanswered and messages unreturned. Just when you think they have done a runner with your money, they turn up with a couple of lads and proceed to throw themselves into a flurry of activity. Of course, they never get through a full day’s work at any stage because they have to leave to get more supplies, which they need more money for, or have some lame excuse about the weather about to turn. What started out as a simple building job suddenly turns into an ongoing mess. The only thing that seems to be going anywhere is your money. These scenarios generally end up with having to get some responsible builders in to sort out the problem and get it finished. It is then you discover, that nothing has been laid properly and may even be dangerous. The Eight of Pentacles Reversed warns you to be on your guard when hiring any tradesmen for they may not be reliable or even qualified. Make sure you ask for proof of their trade credentials and check all documentation and references thoroughly. If they cannot give you a list of satisfied customers to contact, then give them a wide berth for they are probably cowboys. 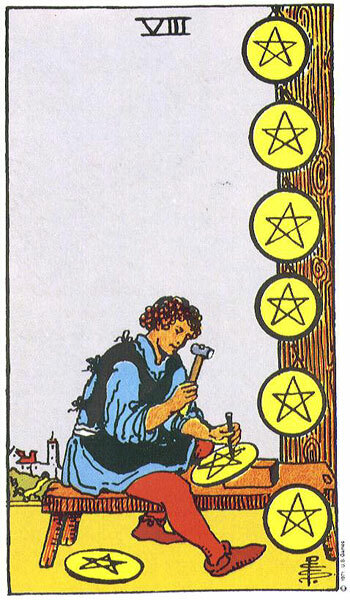 On the other hand, when we look at the extreme aspect of The Eight of Pentacles Reversed, we can recognise all too easily the highly qualified professional or skilled tradesman whose work has either dried up or gone altogether. Recession may have had a terrible impact on your livelihood, and whereas once you were busy and in great demand, no one now has the money to spend on your quality goods or services. You are left in a dilemma because what you once prided yourself on, and trained so hard to get, has possibly left you in a situation where you are unemployable. You may be left with no choice but to retrain in an unrelated area or adapt your product or services for the current market. Cheap and cheerful may be the way forward for you now but it will bring you no sense of personal satisfaction or fulfilment for you are not doing what you trained so hard to do. However, this Reversed Eight of Pentacles will remind you that you must do what you have to do at the moment to survive. It asks you to keep your head down and work as hard as you can to ride out the storm. The Eight of Pentacles Reversed often suggests a lack of patience and frustration. You may be tired waiting for things to happen or take off. You might want a rapid return on your investment and are not prepared to wait for it to mature. Your desire to get rich quick may find you taking short cuts and making mistakes. You might risk losing everything you have invested if you make a move too soon. Try not to take any sudden drastic action or make impulsive decisions that will leave you exposed and vulnerable. You may have a tendency to self-sabotage any opportunity that comes your way. The Suit of Pentacles also governs the physical body and in the Upright we found great health and a commitment to looking after and caring for oneself. However, when this Eight Reverses we have two extremes. You may not be paying attention to your body. There may be too much eating of the wrong food types and excessive drinking. You may not be getting regular exercise and have become lazy and lethargic. Weight is bound to pile on and your health could be affected. Then again, you may have become muscle-bound from weight training and overdoing it in the gym. You may also have gone overboard with dieting or extreme food fads. A healthy balance needs to be found. The Eight of Pentacles Reversed can suggest failure in exams. The terrible thing is that you do have the ability but have been lazy and lackadaisical about your work. You are not pushing yourself enough. You have also been setting your sights low, prepared to accept mediocre results when you could easily be top of the class. You really need to commit to what you are doing and apply some self-discipline and control if you are ever going to qualify. This Card Reversed does not augur well if you have been hoping for an award or scholarship. You are likely to be disappointed, but yet again, the necessary work has not been put in. You could easily let a golden opportunity slip between your fingers. Where Relationships are concerned, The Reversed Eight of Pentacles suggests that you are not putting any effort into maintaining yours. You could have a habit of not being able to follow through once the initial stage of a relationship has passed. You may start out with good intentions only to find that you lose interest or become lazy in your approach. The Eight of Pentacles Reversed is a warning sign for lack of commitment and disinterest. Either you or your partner thinks only of them self and their needs. They couldn’t be bothered doing anything, especially for their partner. This could be a very selfish relationship. You or your partner may be a workaholic, which makes for an unhealthy and unbalanced relationship. Your career may be more important than your relationship if you are very ambitious. Then again, you may choose to stay single while building your career or business. You might also walk away from a very promising career in favour of your relationship, especially if you decide to start a family. However, this Card does remind you that you have many talents and when you are ready can easily work from home or start a home based business. The Eight of Pentacles Reversed can suggest that you are you bored in your relationship? Does it all feel like too much hard work? Do you really love your partner or are you just with them for the financial rewards that may be gained? If your you or your partner are setting up a business then this Reversed Card can suggest you won’t see a lot of them. It depends on how committed both of you are to the relationship as to whether it will survive this period of time. Remember, all hard work and no play made Jack a very, very, very dull boy indeed. This Reversed Card can also act as a warning that the person you are getting involved with may be in a lot of financial debt or difficulty. Career-related, you may be working in a boring job but continue to stick with it because the money is good. You might deliberately choose a job or career based on the little amount of work you have to do to earn your pay. You may be looking for a lifetime job that will offer a pension and perks but with few challenges or the chance for advancement. It might be a cushy ride you are looking for. There can be a lack of ambition in your life and you probably have no goals set for your future either. You might be prepared to just drift along, doing casual work here and there as you go, with no real plan of action. You might also be in a job that has no prospects. No matter how hard you work, there will never be a promotion or pay rise. You may need to think about looking for a new job. Perhaps you are not qualified for the job you really want so you may have to think about enrolling on a course of study. You may also have oversold yourself for a position and are now struggling to complete tasks. Then again you may have gone as far as you can in your career but still feel that you have not realised your full potential. You will need to sit down and give this some thought. What else would you like to do? Have you a hobby that could be developed into something more? The Eight of Pentacles Reversed can highlight the problem of being under-qualified or possibly no qualifications at all? The lack of ambition and qualifications may find you taking on jobs that are boring, repetitive and meaningless. In the Reversed Card, the Pentacles hanging on the wall now take on the form of a conveyor belt in a factory. Your work could involve you doing the same old thing over and over, for hours each day. This scenario is often found with young people either opting out of school early or refusing the chance of college because they couldn’t be bothered with all the study. Trying to put an old head on young shoulders, as we all know, is next to impossible and the young people are quick to point out that all they want is to get a job and earn some money. So that is what they do. At first, in their early years, the freedom of having a bit of money in their hand at the end of the week sustains them. They can buy their own clothes, socialise, possibly get a second-hand car and go on the odd holiday. As far as they are concerned , they have made it and have all they need. It takes some time for them to realise that without further education, training or up-skilling, it is unlikely that they are going to go any further than where they are now. You may become bored with your job and work habits. You could possibly be working very hard for little pay or could even be out of work. Your job has probably become tedious and repetitive. You may have reached a stage or age that finds you regretting not going to college, learning a trade or getting properly qualified in something. However, the Eight of Pentacles Reversed, reminds you that it is never too late. You could go to college as a mature student or begin a course of study in your spare time that will lead to qualifications. On-line Study is always another option that can be fitted into a busy lifestyle. Chances are at this stage you have a fair idea of what you would like to do, and so should eagerly apply yourself to the study of it. If not, then you need to go back to the Seven of Pentacles and spend time giving thought to your future. Decide where you want to go and who you want to be. This Reversed Eight, depending on surrounding cards could highlight the very real dilemma of being highly qualified but unable to find work. On the other hand, you may have a very good job but are taking it for granted. For some reason, your mind is not on your work at present. There are outside distractions interfering with your work. You may be bringing personal problems into the workplace and are not getting your job done. Then again you may be socialising a bit too much, coming to work late, tired and hung over. Your work is definitely suffering, the quality of it has gone down hill and is lacking in your normal professionalism. It is unlikely that you are meeting targets and deadlines and are totally disorganised. Your work is really not up to scratch and others are noticing it too. It is time to get a grip of yourself and knuckle down, otherwise you may get called to the Boss’s office for a right telling off if not an official warning. You may also be spending more than you are earning, as bills mount and credit cards get maxed to the limit. The Eight of Pentacles Reversed can suggest that you have many talents and abilities but fail to use or develop them. You could turn your hand to anything but either through laziness or lack of self-confidence you neglect to give anything a try. Your life may lack purpose and direction. You may not have great staying power, so when a job reaches the point of focussed concentration or difficulty, you can feel panicked or overwhelmed and doubt your ability to complete. You think failure instead of success and concentrate on your weaknesses instead of your strengths. Go away and quietly tackle from start to finish, just one small task. Don’t tell anyone what you are about for that will put pressure on you. You may just need to be left alone to get on with your work. Take small steps and put your very best into it. Practice makes perfect. As long as you do not try to overstretch yourself immediately, you will get there in the end. In Business, The Eight of Pentacles can suggest that you have been so absorbed in your work and what you do that you may not be aware of changes in the current market. You may be producing or over-producing goods that are no longer in demand. You may be breaking your back on a business that is going nowhere. Your business may be outdated and old-fashioned or totally disorganised. You need to go back to the Seven of Pentacles to re-evaluate and review your business plan, as it needs to be changed. In business, you may also be trying to do too much yourself. You may be working 24/7 with little time to rest or relax. This could be down to an inability to delegate or the lack of funds to hire help. You may not trust others to do the work or perhaps you check and recheck all your staff’s work instead of letting them get on with it. If you have cut corners with hiring under qualified staff, then it is bound to show through in the quality of their work. Be very careful if there is a tendency to avoid spending money within the business. You may think that you are being prudent and sensible but very often you have to speculate to accumulate. Therefore, if equipment needs updating, staff need re-training or a product needs re-vamping, put your hand in your pocket and pay for it. There is also the tendency with the Reversed Eight of Pentacles to turn into a workaholic. You may have lost sight of your goals and dreams in the midst of hard toil and labour. You may work just for the sake of working, with little personal enjoyment. You may have your finger in too many pies. Results and Outcome can become more important than job satisfaction. It might be all about money, money, money and nothing else. All work and no play made Jack a dull boy. If you have been working on a large commission or contract, you may find it difficult to get paid when the Eight of Pentacles is Reversed. Do not leave any chance for complaints about your work or the quality of the finished product, for your buyer may try to get you to knock down the price. Make sure you get everything in writing and are crystal clear about the job specification before you start.